Our patients regularly pay us the greatest compliment by referring family, friends and co-workers to our office. This is because of Dr. Fier’s recognized expertise, gentle touch, open and honest communication, use of the latest technology, and our friendly, well-trained staff. Our reputation for excellent dental care depends on two things …our continued dedication…and your good word. 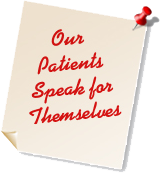 Following are some of the many comments we receive from our patients. 9 mos passed and I'm smiling n dancing thanks to a killer smile I'm sporting around because of the amazing effort put forth by Dr Marvin Fier, one bitchin dentist! A chance meeting at Ramapo town hall. It's the 1st time he looked at my situation and said "l can help you" And so we started wrkg together...him with expertise...me with 4 bad teeth left. Fast forward-l received my new dentures in Dec. they were a great fit, a little discomfort but l was ready to run with em. Whoa hold up there...the Dr reigned me in "a little discomfort isn't the way we do things here" He started adjusting in honing until the new plates felt natural. Dr Fier doesn't rush any part of the procedures and will only move on when it's right! Now for those who have anxieties about the dentist chair, needles and "The Room" Dr Fier is your man!" I can’t thank you enough for the time you took yesterday to examine and repair my teeth.